An anniversary can be a prompt for a total revamp of a company’s website. This has some merit both in saving costs and integrating historical content into the main corporate story. And it is what Red Funnel, the original ferry operators to the Isle of Wight, did this year to mark their 150th anniversary. The firm started out in 1861 with a less snappy title – the Southampton, Isle of Wight and South of England Royal Mail Steam Packet Company Limited. It redesigned its website with a banner featuring both company and 150th anniversary logos and engaging historical content. There is excellent detail of the vessels and routes plied – much of which, I think, is the work of Keith Adams who has also produced an anniversary book. I liked a charming promotional film which shows the Solent, Sandown, Shanklin, Southampton and Cherbourg in 1933, in the heyday of leisure travel ahead of the bombing and destruction which followed. The site also scores well on providing external links not just to the history of the Isle of Wight and Southampton port (owned by Red Funnel’s owners, the investment infrastructure arm of the Prudential group) but also to other websites. Paddle steamers were the original vessels – mostly Clyde built but you can also find out more about the wider preservation movement which aims to keep fleets going on the Swiss and Italian lakes. What is lacking is the human element – the people who set up and ran the company through thick and thin. 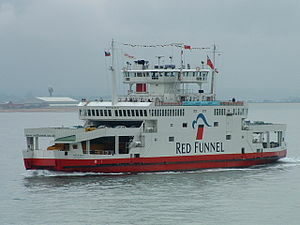 But the content should be easily updatable and serve Red Funnel well for the years ahead. There are one or two proofing errors – an important one on a pdf file for a photographic competition due to end this month. And the trouble with pdf files is that they are very difficult to change – so you are usually stuck with them, warts and all. Overall, it is a very neat presentation offering a real insight into the starting point for the great and good on ocean liners plus the hoi-polloi like me for whom steamboats in Southampton and heading to the Isle of Wight festival have many different memories.